with special treats donated by Dough, Baked by Melissa, Schmackery's and Magnolia Bakery! 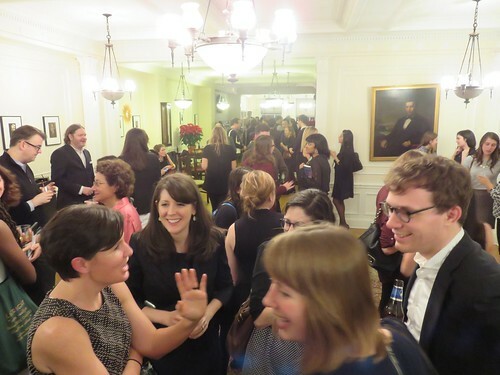 On Monday, December 7th we hosted a fun evening of cocktails, mingling, and readings from the seven finalists of The 2015 Center for Fiction First Novel Prize. All proceeds supported our Books for NYC Schools/KidsRead program. Couldn't make it? You can still help these great programs by donating today! We had a little fun at the party by asking our guests which book they'd love to see turned into a TV show. Click here to find out what they said! Our First Novel Prize is awarded to the best debut novel published between January 1 and December 31 of the award year. The author of the winning book is awarded $10,000 and each shortlisted author recieves $1,000. The winner, The Sympathizer by Viet Thanh Nguyen, was announced at our Annual Benefit and Awards Dinner on Tuesday, December 8 at The Metropolitan Club. Thank you to our tasty sponsors!